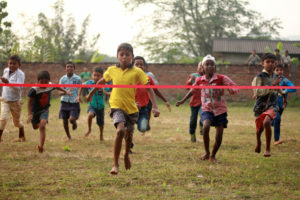 The Center for Development Studies and Initiatives (CDSI) of the University on 17th November organized a Community Children’s Day at Medhikuchi Community Ground where local children from various villages participated in a number of activities organized for them. 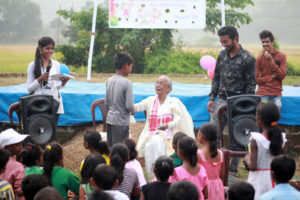 Apart from organizing party games and sports, the CDSI invited Dr. Anuradha Baruah, a renowned Children’s Book writer and a retired Professor of Botany at Guwahati University, for a session of story reading. 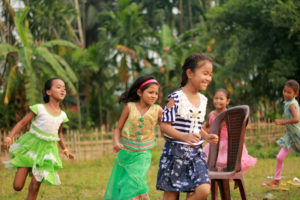 Dr. Anuradha Baruah has published 14 Children’s Books and has received a number of awards including NCERT Award for best Children’s Literature, Dr. Nirmal Prabha Bordoloi Sahitya Award, Pradip Sinpani Award etc and has also written a number of dramas for children and had regularly conducted children’s programme on radio and television too. 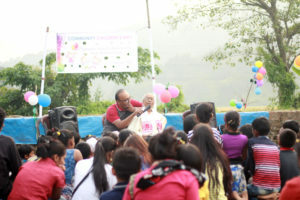 After participating in various sport items, children huddled together around Dr. Anuradha, who travelled more than an hour to be with them, to read stories from her book. One can see the undying love and excitement on her face as she started telling them stories, after stories. Dr. Anuradha also donated 60 children books to the CDSI. The CDSI and the University convey our sincere gratitude to her for being with us and making it a special and unforgettable day for the children. Thank you!